Fibre Channel over Ethernet (FCoE) is an encapsulation of Fibre Channel packets over Ethernet networks. This allows Fibre Channel to leverage 10 Gigabit Ethernet networks while preserving the Fibre Channel protocol. FCoE maps Fibre Channel natively over Ethernet while being independent of the Ethernet routing scheme. 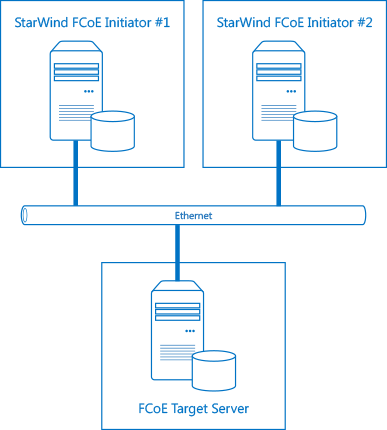 FCoE Initiator fully implements Fibre Channel-over-Ethernet client side protocol enabling you to connect to remote storage appliances such as those developed by Qlogic and Cisco. FCoE Initiator's FCoE (Fibre Channel-over-Ethernet) support enables connectivity to remote storage devices over a standard Ethernet network, regardless of where the device resides. With FCoE Initiator and Fibre Channel-over-Ethernet you can gain full access to a device, as though the device was installed on a local machine.